Lord Admiral Herschel Brightburg stepped carefully through the shattered bridge of the Imperial Battleship Relentless. Debris and shrapnel were everywhere. A fallen support beam bisected the bridge. That would all be cleaned up shortly; the desiccated corpses of the former crew had already been hauled away by the bio-purification team. Around the Admiral was a buzz of activity. Young officers making observations and taking equipment readings. To one side, the space marine Captain Septimus stood silently with a hand upon his temple, no doubt conferring with his teams via his in-helmet comm. Similarly, Tech Priest Yanus stood with closed eyes, head faintly twitching as he digitally communed with his brothers around the ship. At last, both men stepped towards the Admiral and stood to attention. The tech priest closed his eyes again, presumably reading from some report in his mind. Brightburg bit down on his disgust of cybernetics. This is a necessary evil to serve the Emperor. This was indeed remarkable. The Relentless was recorded lost 750 years prior. For a vessel to spend seven centuries in the warp and emerge relatively unscathed, uncontaminated, that was very rare indeed. For it to appear in range of Imperial salvage operations, just when the Battlefleet was in need of more capital ships, THAT was truly a miracle, one that bolstered Brightburg's faith in the Emperor's guiding light. I think most of you have probably figured out by now that there won't really be regular updates on this site anymore. The truth is, I'm tired of this hobby, and I've got lots of things in my life I'd rather be doing. Games Workshop hasn't done a lot to entice me to stay, either. They ignored my last few e-mails submitting further ideas for BFG magazine. The company in general has started to behave more like a big, moneymaking corporation than the friendly neighbourhood hobby store I knew when I started the hobby. Personally annoying is the fact that after 2 years of loyal service to the BFG online community (which included getting an article published in BFG magazine) and several requests, Blackstone Six still hasn't been added to the GW Warpgate Network. Not only that, but there are NO BFG EXCLUSIVE SITES on the GW Warpgate Network. Anyways, I encourage those of you who are still loyal GW fans not to follow my example, as long as this hobby is still fun for you. This site is not closing down, we may even post additional articles from time to time (as Lord Admiral Acoron is still eager to pursue the hobby). However, for regular updates I point you to Starship Combat News. They're a reliable BFG news site and they've scooped Blackstone Six many more times than we scooped them. To all of you who have visited and written regularly over the past two years, I say thank you. So THAT's why the BFG website has sucked so much lately. Apparently, specialist games once again have their own server. Apparently, the people at GW web design want to win us over by constantly moving everything around so that our links will never be up to date. ANYWAY, BFG Magazine 15 has been released, which includes some material for the big, scary Eye of Terror worldwide campaign. You can see a cover image here. After a month of waiting for confirmation of BFG mag 14 on the official GW website, I've realised that the GW web guys don't actually care about supporting Battlefleet Gothic anymore. So, I'm mirroring a news update from the venerable Starship Combat News site. 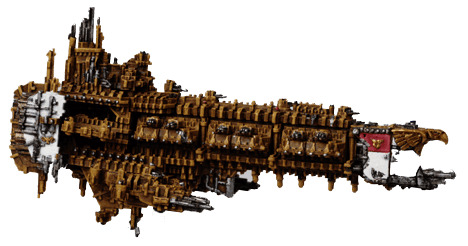 BFG magazine 14 contains a detailed list of the ships of Battlefleet Armageddon. There's also the third part of the Cerberus campaign. You can see a cover image here. 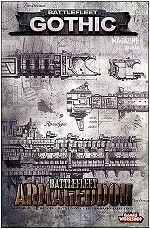 The new Apocalypse Battleship model is avalible through U.K. mail order. epic40k.co.uk had its spies lurking around the Salute 2003 festival in Britain. They've posted a page of pictures which includes some GW-brewed (ie: non Forgeworld) Space Marine Escorts, the new Daemon-possessed Chaos cruiser, and some more delicious Tau ships. Epic 40K players will also be greatly impressed with the new models which create parity with the look of models in the 40K Space Marine range. Lastly, (but not leastly) it seems that there will be no BFG Annual this year. Cool your jets, we're getting something better: a supplement will be released called "Battlefleet Gothic: Armada". This supplement will remain in print and will contain all the official ships for BFG from the rulebook to the latest material. A must for any BFG player. Rally your forces, servants of the Imperium, the day you have long feared is at hand. Abaddon the Despoiler is launching another Black crusade from the Eye of Terror. The new Eye of Terror website will include weekly updates with material for several Games Workshop games, including Battlefleet Gothic. We do! For the first time in months we've got a brand new article for you to play with. Our Capture the Hulk scenario involves a mad scramble of a battle in the middle of a ship graveyard. The objective? Capture the hulk of a rare and powerful ship before the enemy does. Included are photos of our own graveyard. A few months ago, John Webber sent us some excellent photos of his model for our Inquisition Corvette. Sorry it took so long for us to post them. Really good job, John! After a long wait, Gordon Rennie's new BFG-themed novel Shadow Point is avalible from the Black Library. The story, sequel to the novel Execution Hour, features the delicate negotiations between the Imperials and Eldar for an alliance against Chaos during the Gothic War. Dark Eldar also play an important role in the story. Check it out if you have a chance. Today we poked our heads out of our burrow and didn't see our shadows, so we decided not to go back to sleep for winter. 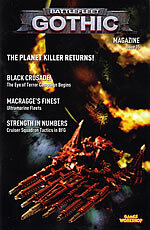 BFG Magazine number 13 is here, with rules for Ork Battleships. You can read all about it on the official site. Commissar Sonata here. Now, I've been a pretty good little Games Workshop consumer up until this point. Members of the BFG list know that I recently made a huge rant defending the way Dark Eldar escorts are sold against peeps who think/thought that it was a marketing scheme. However, if what Lexington of Misfire (the hilarious and scathing 40K web comic) says is true, those days are over. I don't know about you, but for me, broke student + price hike = no more hobby gaming. Well, actually, the Christmas gifts will come a bit later. We're just indicating that we're still here. Don't be disappointed, we've got your pre-Christmas gift right here. It's a custom Space Marines battle barge we've named the Honor of Caliban. Conversion and fluff included, Space Marines sold seprately. Also, we've updated the About Us page with some pictures and brief bios. Thanks to all our readers for bumping our counter over the 10,000 hits mark. More Christmas goodies are on the way! Battlefleet Gothic, Warhammer 40K, Fanatic Games, and all other registered marks herementioned are property of Games Workshop Ltd. All Warhammer 40K universe characters, images, and related marks on this and all linked pages are the property of their respective owners. Blackstone Six fully supports the Intellectual Property Policy published by Games Workshop. This site and all affiliated materials are in no way, shape, or form associated with Games-Workshop Ltd. or any of it's affiliates. Blackstone Six is for non-commercial purposes only. Any misuse of copyrighted materials is purely accidental. © Outpost 10F (www.outpost10f.com) 1997 - 2003. All rights reserved.